I recently coached someone who told me after the rehearsal that they are about to turn 40, just really getting started in improv, but didn’t think they belonged in the improv community because it skews so much younger. Ugh, no! This broke my heart and made me furious at the same time. I told them how ridiculous that is, and now I’m telling you all. Improv should be for everyone. Improv has had a diversity problem since forever in so many ways. As accepting of others improv wants to be at its core, in practice, institutions and individual performers aren’t doing enough to actually make everyone feel welcome. 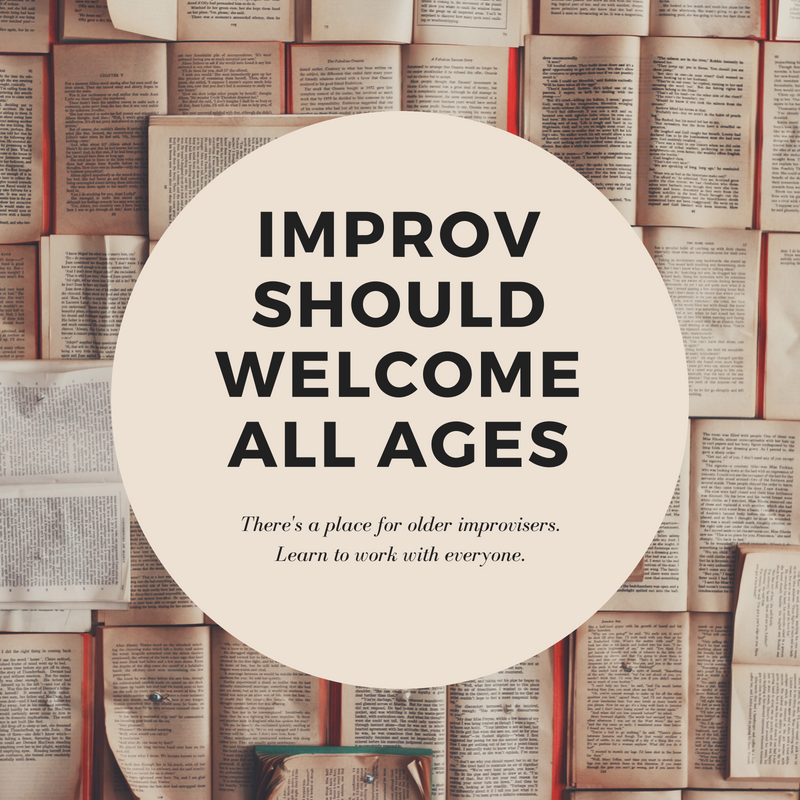 Age is just another drop in the bucket of things the improv community needs to start accepting better. Here are some thoughts for the young people and older people alike. In a lot of ways, improv is just a matter of us recalling our various experiences and being inspired by them to help shape our performances. The more experiences we have, the more we have to pull from when we are on stage. The more ways we have to make connections with our partners and our audience. Someone who has lived longer has more experiences. That’s just how time works. That’s just life. They’ve succeeded and failed many times. Traveled more, read more, loved, lost, and generally lived more. If you are older, you have so freaking much to offer the artform. You just need to gain the confidence to know how much you have to give. There isn’t anything about being older that will prevent you from becoming a confident improviser. It will just take the work and reps like anyone else. This isn’t a slight on younger improvisers, who also have a lot to give, just in a different way. It is important to recognize, that generally speaking, younger improvisers don’t tend to have as much to improvise about. You see a lot of young improvisers doing scenes about high school or arguing with their parents who don’t understand them. This isn’t their fault, in a lot of cases they just haven’t yet had much experience as an independent adult in the world. I know I definitely wasn’t improvising about employee stock purchase plans or changing diapers 5 years ago (my content is wild these days). While there are a lot of ways that younger improvisers can gain more perspective (reading a lot being a huge one), it just takes living life more to be able to have more you can confidently portray on stage. Again, this isn’t a bad thing, but it is important to recognize this so you can play well with actors who are older than you. Improv is great because it allows us all to be anything. Keep that in mind when you are working with someone who might skew older than you. Allow them to be anything and have fun. Stop always labeling older people as your parents or grandparents, or a principal, or crotchety neighbor. They can be your spouse or younger sibling. Or guess what? We don’t even have to label their age at all. Shocking I know! My hunch is these offers get made subconsciously from our own age biases, but you should absolutely make yourself aware when it happens. It is your responsibility as an improviser to take care of your partners and let them explore their own creativity. Help them look amazing, and they will do the same for you. This includes not pigeonholing an actor because of their appearance. Can you imagine how annoying it must be to never be given a chance to be anything else other than an overbearing, high-status older person? I promise you, these folks are tired of being your parents. Worse than type casting older improvisers, some are being straight up jerks to them by making direct jokes about their age. That isn’t cool. That isn’t funny. You’re a jerk for marginalizing your partner as a human for a joke. You’re breaking the reality of what you are doing. Please stop. Maybe you are working with someone whose hearing isn’t great anymore or they make a dated sounding reference that goes over your head. This is no reason to call them out on stage. Just repeat yourself, ask about the reference after the show, and go read a book. Because guess what? This person might have many more years of experience improvising than you and you can learn something. You don’t know as much as you think you do. Respect them, respect your art, and grow up. Cassidy and I were lucky enough to perform at this year’s Ocean State Improv Festival in Wakefield, Rhode Island. One of the teams that performed was Elderberry Jam. Oh man you should check them out if you get a chance. It was so cool to see some older folks play with such joy and freedom, and get to be anything and showcase their creativity. They were great. Seeing Elderberry Jam made me want to learn more and it introduced me to the “Vintage Improv Community.” For real, there is a Vintage Improv Festival made up of performers over the age of 50. How wonderful! I’m so glad there is a place where these artists can support each other and do the kind of work they want to do. That said, let’s be inclusive. Let’s make these artists feel welcome in our own communities outside of a once a year festival. Get to know them as people. You’ll realize we all have more in common than you think and you’ll be able to work with each other much easier. There shouldn’t be an age where doing this is no longer “allowed.” Shows are better the more diverse the cast is, and that includes age. There’s a place in improv for everyone, but only if we make the effort.